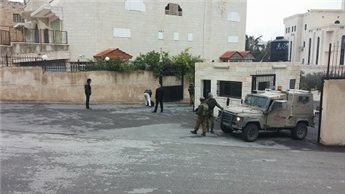 The Ma’an News agency reported a statement from the Palestinian FA that on Monday 24 November three Israeli military jeeps raided its headquarters at 9:20 a.m. and apprehended the IDs of several of its employees, prevented them from entering the building, and interrogated them. They also searched the ground floor of the building, the statement said. Israeli forces spent 40 minutes searching the building and remained around 90 minutes in its vicinity afterwards. A number of journalists who were present in the area documented the raid. Before Israeli forces left the place they tried to prevent journalists from taking pictures. What the news agency did not report was the fact that this was an incursion by Israeli forces into an area over which the Palestinian National Authority(PNA) has jurisdiction. The PNA has responsibility for both civil affairs and security in the West Bank’s Area A which includes most Palestinian towns and villages – including Ramallah where the PFA HQ is situated. So the Israeli action showed a flagrant disregard for the Oslo Accords. Yet again. This act has been condemned by Sepp Blatter, President of FIFA, and by Shaikh Salman Al Khalifa, President of the Asian Football Confederation (AFC). The Palestinian News agency said, http://english.wafa.ps/index.php?action=detail&id=27143, reported Blatter’s statement that the Israeli army’s raiding and searching of the Palestinian Football Association (PFA) headquarters in Jerusalem was intolerable and unacceptable. Blatter subsequently sent a letter of condemnation to PFA’s President, Jibril Rajoub, condemning the Israeli attack and describing it as ‘terrible’. In the meantime, Rajoub said the assault was an attempt to undermine Palestinian sports and called for international condemnation of the incident.